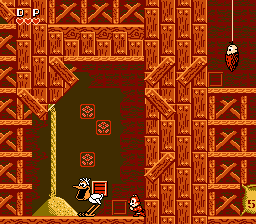 This is level hack for Chip & Dale Rescue Rangers made by Roket with CadEditor level editor. 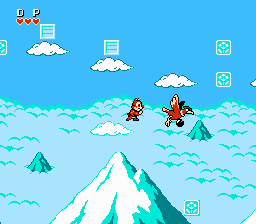 Now brave chipmunks walk on levels from Tale Spin and Mickey Mouse Adventures. Music and bosses also changed. This is really a masterful achievement and the level design and enemy placement are wonderful (too difficult for beginners on the early levels). 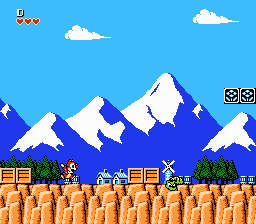 Feels very familiar to the classics, but is basically a well thought-out combination of the two games. The biggest negative in my mind is the music and sound effects. 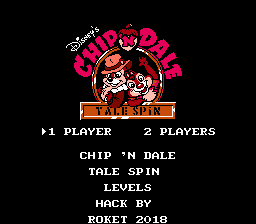 The music appears to be mostly from TailSpin, which is to the hack’s detriment even if the point of it is to feel like TailSpin. Very obnoxious tunes, mostly sounding like Capcom’s “B-team”. I wanted to play this more, but I think the hack has too many difficult parts near the beginning for beginners to enjoy this (while battling through the bad music). 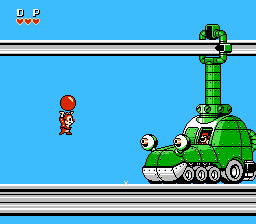 In the original game, there weren’t too many tricky platforming parts until later levels, but this will definitely present a reasonable challenge.